Yesterday was Independence Day. What a glorious day to celebrate the beginning of our wonderful country! To celebrate, we organized a block party for all our neighbors, held in the culdesac in front of our house. Our next door neighbor concocted the idea with us, and we spread the word, knocking on everyone's door to let them know of our plans. After setting up a canopy in the street, and covering several food tables with bright cloths, our neighbors began to trickle out of their homes, with bowls of potato salad and platters of fruit in hand. Several of them wheeled out their barbeque grills and soon the air was full of the scent of smoking charcoal and seared meat. I sat at a table with the couple who lives down the street from us, laughing with them as they fed their little toddler boy sliced tomatoes, and wondering why I had never met them before. The husband, who I now finally know to be named Joe, mentioned that he has seen my son Ethan playing soccer a lot. He told us that he wanted to come and offer to play with him, but felt like it might be strange to come and approach Ethan about it when he didn't know him. Another neighbor's son brought out his pet gecko to show around, and then passed out bubble wands for the little ones to play with. I discovered that a woman who lives around the corner from me has been a children's book author for thirty years. When my husband Eric told her that publishing was a dream of mine someday, she got excited and told me that we have a lot to talk about. It felt good to get to know my neighbors. We always waved in greeting before as we sped out of our driveways and on to our daily lives, but now I will probably actually stop and talk to them. We will be better equipped to look out for each other, our properties, and our children running around in the culdesac just because we know more about each other now. Last night, as I sat in the safety and comfort of a beautiful home, surrounded by the exhilarated spirits of my children hyped up on sugar and fun from the day's events, and listened to the myriad of explosions and pops coming from a city of celebration, I couldn't help but reflect on all that I am blessed with. I watched the huge fireworks show which occurred in New York City and marveled at the impressive display of artistry, choreographed so perfectly by the "Star Spangled Banner" and finally, "God Bless America." I thought about what it truly means to be an American. It means having the freedom to not only dream, but to live your life in a way which allows you to pursue it. It means having the freedom to worship as you see fit, appreciating all that God has bestowed on this blessed land. It means having the freedom and means to make a place your own, and if you work hard enough, own a piece of property for yourself. It means having the freedom to look your children in the eyes and know with all your heart that the sky is the limit for their potential, as long they are willing to work for it. It means having the freedom to question our leaders and legislation, because they are held accountable to us. It means having the freedom to be protected from lawlessness when we obey and honor the laws which have been established to safeguard our rights. It means having the freedom to have an opinion and to be able to express it. It means having the freedom to make our own lives, in our own little blocks, and enjoy the companionship and protection which comes from making a neighborhood a family. I thought about the time that I had felt the most connected to my fellow Americans. It occurred in the aftermath of our recent history's most tragic event, the destruction of the World's Trade Center buildings in New York City. Like most people who were old enough to remember, September 11, 2001 will forever be etched in my memory. The day and the feelings associated with it are so vivid it seems just like yesterday. The morning was spent with me frantically getting ready for work. Ethan had just celebrated his first birthday a few days before, so I was still in the difficult process of preparing a baby for daycare and getting my five-year-old Heidi off to Kindergarten. As I was running out the door, Eric mentioned that it looked like there was an accident at the World Trade Center. I didn't really know what that meant. I don't think I really even knew what the World Trade Center was at that time. By the time I got to work, people were glued to the television in our front office, watching the replay of the plane crashing into the first tower. I couldn't believe what I was seeing. It seemed like such a freak accident. Then my boss speculated, "What if it wasn't an accident?" My mind couldn't make that leap. It still can't, really. Then the first tower crumbled into dust....We were all so shocked, I don't think any of us spoke for several minutes. I just remember crying and thinking, "All those people....."
As the events of the day progressed, including listening to the audio from the plane that was taken back by the passengers, hearing of the Pentagon being hit, and watching firefighters running into the smoke and ruins of the first tower, to their deaths for 343 of them, it was like watching a horror movie. Only this was very, very real. I went home and hugged my babies, so grateful for my family and our safety, but afraid of what the future would bring. No, I will never forget that day, or the people who perished in those airplanes, at the Pentagon, or in the World Trade Center buildings. There were so many heroes, and acts of selflessness. And I will never forget those who answered the call to serve their country and defend our freedoms. Their ultimate sacrifices have enabled us to continue to enjoy our freedom of speech, right to bear arms, right to worship how we may, right to elect our own leaders, and many more. But along with the images of devastation and destruction, I will always remember the sight of house after house, building after building, proudly displaying our magnificent flag. Right after that event, everyone that I knew and everywhere that I looked immediately put out their flags to show their support and solidarity. The red, white, and blue was more than just a pennant flapping in the breeze. It was a symbol of our resolution to come together as American citizens, despite our many differences, and band together in strength, compassion, and commitment. 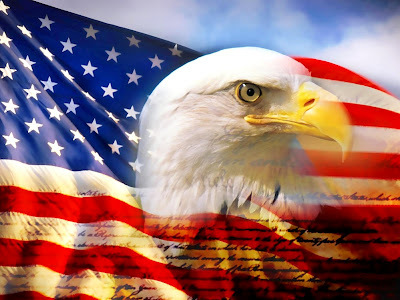 Independence Day is a chance for us to remember these tender feelings for our country, the blessings which we claim for living on this piece of land, and honor all those who have sacrificed so much to ensure the continuation of our freedoms. We truly are the land of the free, because of the brave. I will do all I can to honor the brave, succor the weak, and cherish the freedoms I enjoy. I think a few more block parties wouldn't hurt, either.